Tulsa Warrant Surrender | What is a Warrant Surrender? What’s a Tulsa warrant surrender? If you have a warrant in Tulsa, OK, a court clerk or sheriff’s office staff member may tell you, “You need to do a warrant surrender.” That sounds scary. Signature Bail Bonds can help relieve some of the fear and anxiety. Often times, we can help clear warrants without surrendering to the jail. For certain warrants (Bench Warrants), we can go with you to the courthouse and present a bond without ever being arrested. An outstanding “bench warrant” is a warrant issued by a judge wither because of contempt, probation violation or your failure to appear. There is no need for a Tulsa warrant surrender to clear bench warrant. These warrants can be cleared by presenting a new bond with the court clerk. *NOTE: For Municipal Bench Warrants, you can often times appear in court without the need to make a new bond. What About an Arrest Warrant? If you have an outstanding “arrest warrant”, you will have to clear the warrant at the county jail. However, we can speed up the process and make things go a lot smoother. By having an experienced bondsman with you, your jail experience will be a little more like a trip to the dentist. It won’t be your favorite memory. But we’ll help you through the process quickly without going behind bars. Gather Information. You’ll want to know all the details (bond amount, charges etc.) before clearing a warrant. We can help check all available databases to make sure there aren’t any surprises. Visit With Bondsman in Person. We’re available anytime to meet with you to complete all necessary paperwork prior to going to the jail. We’ll meet at our office. The paperwork process typically takes 15-20 minutes. Ask Questions. It’s always good to get answers to as many questions as possible. When you’re better informed, you can make better decisions and relieve a ton of stress. Don’t wait to ask later. You can Ask Questions anytime. We go WITH YOU to the Jail. You’re not on your own. Our licensed bondsman with walk with you through the process so that you can be confident that someone is on your side. Clearing a warrant is simple. With the right help, you’ll be on your way quickly. Released With a Court Date. After the short booking process (fingerprints, picture and sign), you’ll be released with a court date. SAVE THIS DATE! You’ll have to make all your court appearance until the case has a disposition. 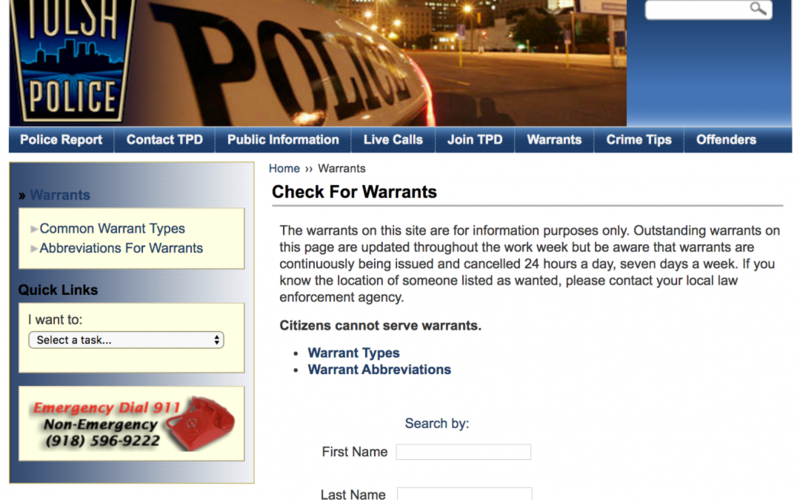 To check for warrants in Tulsa, OK visit the TPD Warrant Site. *NOTE: This system is not always accurate or up-to-date but can be helpful for gathering information.